The tower was recognized as the tallest building in Thailand in May 2016 by the Council on Tall Buildings and Urban Habitat (CTBUH), Chicago. 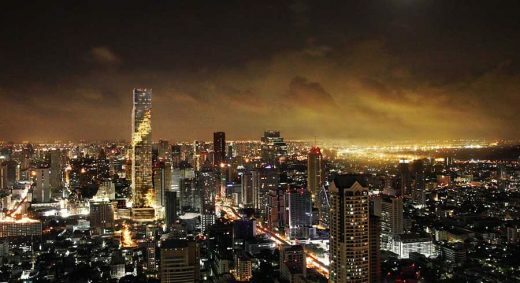 Beginning in Fall 2009, the city of Bangkok – home to an estimated 15 million people – will start to embrace an unprecedented new architectural manifestation of its extraordinary ‘inner world’ when construction begins on MahaNakhon, a dazzling tower designed by internationally celebrated German architect Ole Scheeren, Partner of the Office for Metropolitan Architecture (OMA). 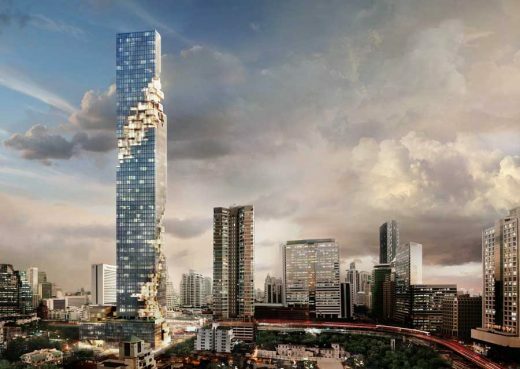 With MahaNakhon, Scheeren, whose many landmark projects include the CCTV Tower in Beijing, has crafted a gleaming 77-storey skyscraper that will be the tallest building in Thailand’s capital. The design moves beyond the traditional formula of a seamless, inert, glossy totem, and instead actively engages the city: MahaNakhon’s pixilated and carved presence embraces and connects to the surrounding urban fabric rather than overpowering it. Its glittering stacked surfaces, terraces and protrusions will simultaneously create the impression of digital pixilation and echo the irregularity of ancient mountain topography. This architectural geography is conceived to convey the energy, intensity and inclusiveness of Thai society and celebrate Bangkok’s emergence as a true global capital, fitting the Thai meaning of the name MahaNakhon, translated as ‘great metropolis’. The Building — With its distinctive sculptural appearance, MahaNakhon has been carefully carved to introduce a threedimensional ribbon of architectural ‘pixels’ that circle the tower’s full height, as if excavating portions of the elegant glass curtain wall to reveal the inner life of the building – metaphorically and actually an architecture that encloses and protects its inhabitants while revealing the inner life of their city. The pixilation gives MahaNakhon an arresting profile on the skyline while generating a set of very special features to house the diverse functions of the building complex in an intelligently strategic way. 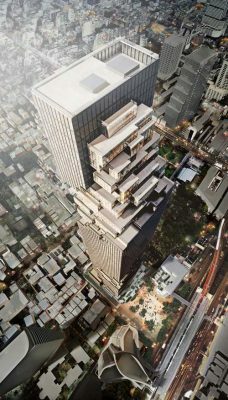 Ole Scheeren’s design for MahaNakhon dismantles the typical tower and podium typology to render not a tower in isolation but instead a skyscraper that melds with the city by gradually ‘dissolving’ the mass as it moves vertically between ground and sky. 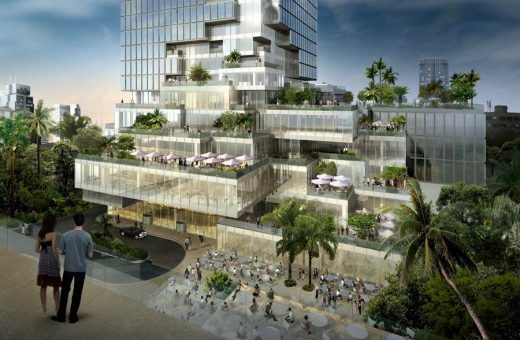 This effect begins with a series of generous, cascading indoor/ outdoor terraces at The Hill – the 7-storey area of tower’s base housing luxury retail and dining. Here MahaNakhon’s architecture is articulated to evoke the shifting protrusions of a mountain landscape. The Hill Terraces fit keenly with the lush, cultivated tropical gardens that give way to the city’s own many green swaths. MahaNakhon Square, located in front of the tower, is intimately connected to the space between The Hill and Cube. This dynamic public plaza – intended as a meeting place, a spot for planned and spontaneous cultural events – will be a landscaped retreat for the city’s inhabitants, a gathering place, a rare venue for cultural and social interactivity, with direct connection to the Chongnonsi Skytrain station and future rapid bus transit system: an urban oasis that provides refuge from the intense daily clamor of greater Bangkok while offering constant easy access for reconnection to it. The Ritz-Carlton Residences of MahaNahkon – 200 two to five bedroom homes on floors 24 through 73 of the building – will occupy projecting glass skyboxes with sweeping views and generous indoor/ outdoor spaces with plunge pools and oversized terraces uncommon to high-rise living in global capitals but well-suited to the tropical climate of Bangkok. 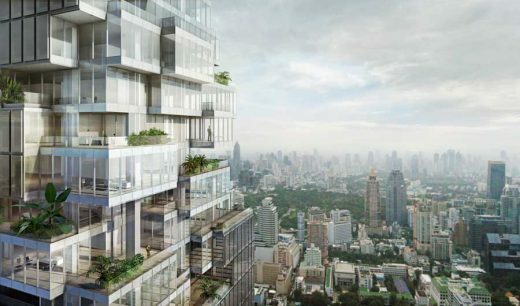 The tower’s ‘pixels’ have been designed to maximize unobstructed panoramas for the residences, offering rare bird’s eye views of the city and the Chaophraya River. Residences located in the non-pixilated portions of the tower will enjoy a parallel innovation: single-level and duplex units here offer grandly scaled double height living spaces equipped with custom-designed cassette curtain wall systems with floor-to-ceiling window walls and operable “bi-fold balcony windows,” as well as secondary operable ventilation panels. The bi-fold balcony windows feature glazing units that fold open inwards to the ceiling, providing an innovative and unprecedented conversion of indoor to outdoor space. 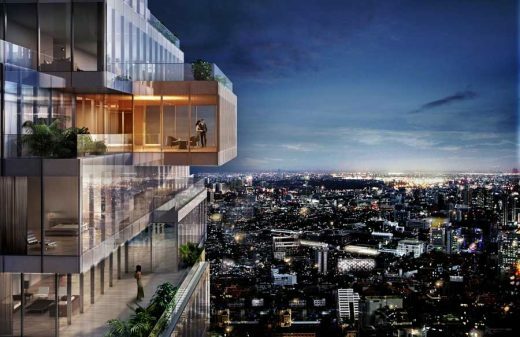 Thus the MahaNakhon tower enjoys great levels of permeability and a relationship to the world beyond. The top of the MahaNakhon tower houses a multi-level three-floor Sky Bar and restaurant with dramatic double-height spaces, private dining facilities for entertaining, and a rooftop outdoor bar with sweeping 360° views of the skyline and river, floating 310 meters (more than 1,000 feet) above the city. About Ole Scheeren, Partner, OMA — Born in 1971 in Karlsruhe, Germany, Ole Scheeren is an internationally acclaimed architect and partner along with Rem Koolhaas in the firm of Office for Metropolitan Architecture (OMA). Scheeren is director of OMA Rotterdam and OMA Beijing and in charge of the firm’s work across Asia. As partner-incharge of OMA’s largest project to date, he led design and construction of the China Central Television Station (CCTV) and the Television Cultural Center (TVCC) in Beijing. His current projects include MahaNakhon; The Scotts Tower and Gillman Heights, both in Singapore; a media center in Shanghai; and the Taipei Performing Arts Centre in Taiwan. Since 1999 he has directed OMA’s work for Prada and completed the Prada Epicenters in New York City (2001) and Los Angeles (2004). In 2006, Scheeren designed two exhibitions – one for The Museum of Modern Art in New York and another for Beijing – featuring the CCTV project. Ole Scheeren joined Rem Koolhaas and OMA in 1995 and became partner in 2002. Previously he worked for Press Release, Page 5 of 7 — July 23, 2009 architecture firms in Germany; collaborated with 2×4, a graphic design firm in New York; and was engaged in a range of projects through his own studio in the United Kingdom. He has been involved in various art initiatives and exhibitions, such as Cities on the Move in London and Bangkok, Media City Seoul, and the Rotterdam Film Festival. Scheeren’s work is featured in the collections of major museums, including the Museum of Modern Art MoMA, New York. He writes and lectures on a regular basis. Educated at the Universities of Lausanne and Karlsruhe, Ole Scheeren graduated from the Architectural Association in London and received the RIBA Silver Medal. 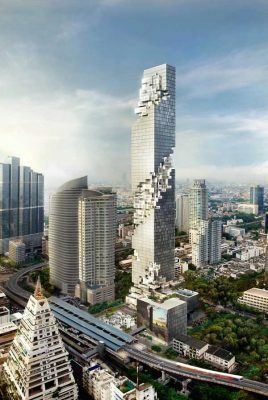 MahaNakhon Tower Bangkok images / information from Andrea Schwan Inc.